Phase contrast is a microscopy technique that is helpful in viewing many biological specimens such as bacteria or blood cells. 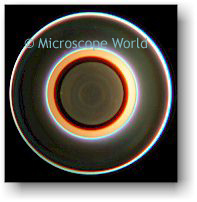 You can learn more about phase contrast here. When setting up your phase contrast microscope, you must have phase contrast objective lenses and a phase contrast condenser. 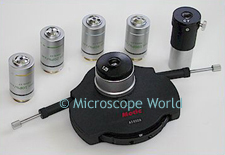 This is the phase contrast kit that is used with the MW4-H3 phase contrast microscope. The phase contrast kit contains four phase contrast objective lenses, a centering telescope and a Zernike phase contrast condenser. 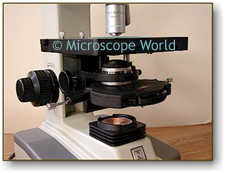 Not all phase contrast microscopes are the same, but the information below is usually similar and should help you when trying to set up your phase contrast microscope. The condenser shown above has five settings on it: 10x, 20x, 40x, 100x and BF. These stand for each of the phase objective lenses and BF = brightfield (no phase contrast). The two screws that stick out from the condenser are centering screws and will be used when you set up the phase contrast microscope for the first time. Phase contrast condenser as seen on the microscope. Set the condenser on the BF setting and focus on a specimen. Adjust the height of the condenser for optimum image quality. Move the condenser turret to the phase setting for whichever lens you are currently using and remove the specimen. Remove one of the eyepiece lenses and insert the centering telescope in its place. 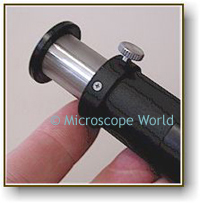 If there is a set screw on the side of your centering telescope this should be used to focus the centering telescope. 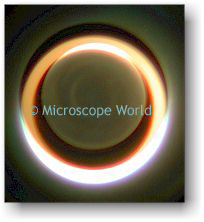 When looking through the centering telescope you will see two rings (shown below). By turning the centering adjustment screws on the condenser, you can align the rings so they are concentric. Remove the centering telescope and replace the eyepiece lens. Put your specimen back on the stage and you are ready for phase contrast observation! You will want to go through this process when you change objectives. You are now ready to view specimens in phase contrast! Remember that when you change your objective lens to a different magnification (such as 40x), make sure you adjust the phase condenser to match the same setting.